So, I have a confession: I'm kind of obsessed with crepes. 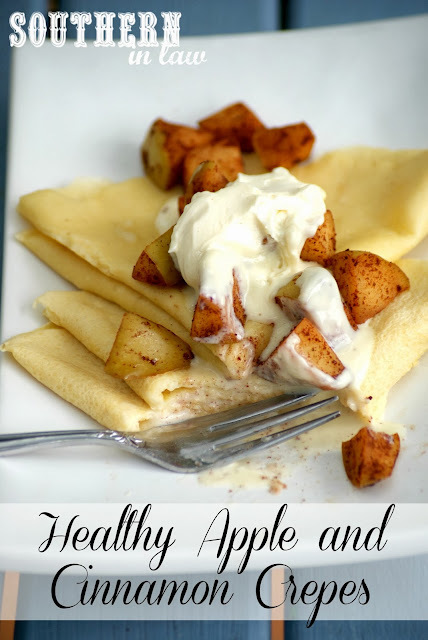 Ever since I got our awesome new crepe pan, I've been whipping up batch after batch of delicious crepes - but this recipe may have to be my absolute favourite. Not only is it so simple to make, it's so delicious you'll almost want to lick the plate (Jesse would, but I'm a bit more lady like than that :P). The apples are super juicy and delicious and covered in cinnamon, the crepes are light and the perfect vessel for soaking up the incredible creamy mascarpone topping that turns into a heavenly dollop of goodness once to warm up from the apples. This recipe kind of took my crepe addiction to a whole new level. In fact, I'd just devoured them (at the little blue "Southern In-Law table" whilst taking photos - bite shots are important guys!!) and I called Jesse and said "do you know how you spell genius? K-R-I-S-T-Y". Modest? Apparently not... But these crepes are so incredibly good I can afford to blow my own trumpet. But enough yapping from me, let's get onto the recipe so you can make it ASAP! Sauté your apples and cinnamon in a small saucepan with the water, cooking and stirring until the apples have softened. You may need some more water, just use your best judgement. Meanwhile, mix together your mascarpone mix - adding enough maple syrup to reach your desired level of sweetness. Next, heat up a small non stick crepe pan or frying pan over a medium high heat. Rub with a little bit of butter or lightly spray with oil. 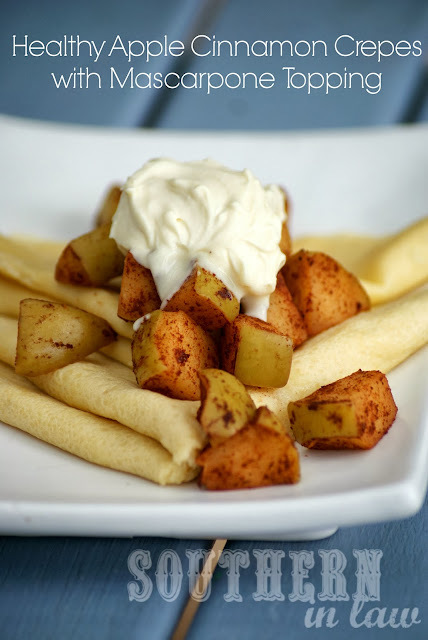 Pour half of your crepe batter onto the pan, swirling the pan to evenly spread out the mixture. Wait until your edges begin to curl up and the top of your crepe has set and gently flip the crepes over to the other side using your fingers or a spatula. Cook on the other side for about 1 minute and set aside. Repeat with the remaining crepe mixture. Once your crepes have cooked, fold each in half and in half again and place onto a plate. 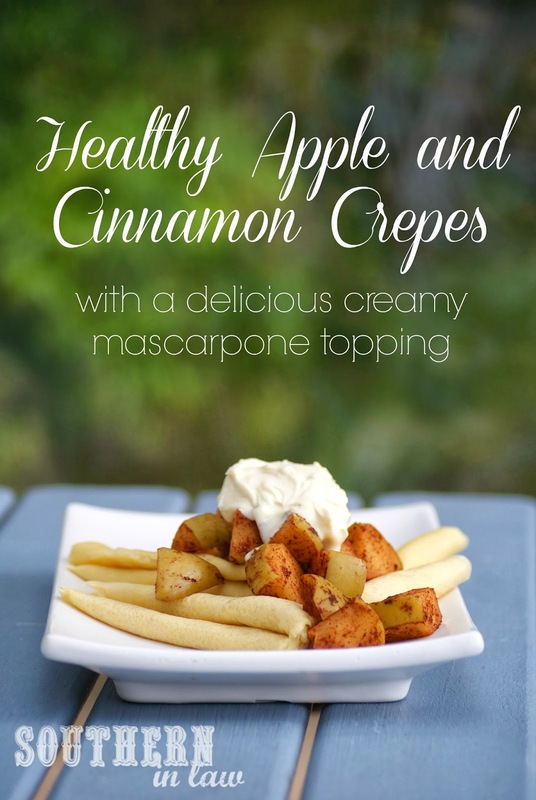 Top your crepes with your cooked apples and then dollop your mascarpone mix on top. But tell me, are you a crepe fan? What's your favourite toppings?